The Histogram | Stop Shooting Auto! ← What Is Bulb Mode? Digital SLRs have a really cool feature that’s often overlooked by novice photographers, but is heavily-used by professionals. It’s the histogram, and it can tell you a lot about how well your image is exposed. I’ll be writing more about it soon. 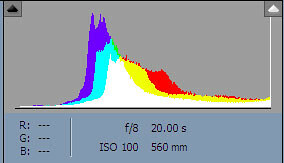 This histogram came from Photoshop, but your camera should provide you with a similar though probably simpler display on the LCD. Do you ever use the histogram? Do you know how it works? Have you even noticed that it’s there? I’ve seen it, but I didn’t know what it was called and I’ve never used it. Same here. I’ve seen it, but haven’t got a clue what it’s for. teach us! okay, just read through the whole blog, and you have taught me a lot! My big issue right now is lighting…. I love taking pictures of my kids, but since they are kids, they dont sit still- so I need a fast shutter speed. Since we’re inside (we live in AK, its still gross spring here)- my camera wants a slow shutter speed to let more light in. If I use the on-camera flash, how does that work with my metering? Should I change anything to compensate? Also, my flash is so harsh that I cover it with a napkin to diffuse it… should I change anything to compensate for that? On my wish list, a flash that I can angle and bounce off the ceiling! Erica, flash is a great big can o’worms. It’s also something that I’m less than expert at– I generally prefer to use existing light whenever I can. Then again, I’m rarely shooting energetic younguns. Cameras have gotten pretty smart about how they work with flash. If your camera has an on-camera flash, then your meter should take it into account in aperture priority, shutter priority, and P modes. I honestly have no idea what it will do in manual mode, but I can experiment and figure it out. Check out the shots to see if they’re correctly exposed or if they’re too dark, and if they’re too dark add a third or a half stop of flash exposure compensation and try again. I wouldn’t be surprised if the camera compensates for the diffuser automatically, but if not it shouldn’t take too much extra oomph to get a good exposure. As much as I hate to admit it, this is one of the situations where the camera will probably do a credible job without much help. Definitely keep diffusing the flash, though– that will make the light much more appealing. And if you want to learn a lot of really good stuff about lighting techniques, check out the Strobist blog at http://www.strobist.com. They focus on off-camera flash, but they have a wealth of information about general lighting techniques.